1) Set up Indo account via Indo store (on website). 2) Purchase sub via store (on website). 3) Set up the new Indo account on console (has no bearing on your UK account). 4) Set Indo account as a primary account on console (again has no bearing on UK account). 5) Log out of Indo account. 6) Log into UK account. 7) You can now go online from the UK account (using PS+ benefits of the Indo sub). ‌You must download free PS+ games from the Indo account, however they may be played on your UK account. Update: Please note only Starling cards may be used on the Indonesian store, Revolut and N26 cards are now permanently blocked. PSN top up cards may be purchased from a number of stores - please ask in thread for Advice. Indonesian account required. Once set up ensure account is set to primary on your console and you are able to use the online multiplayer benefits from your UK account. Note - the setting to primary has no bearing on your UK account settings. Great deal until I saw which cod it was. 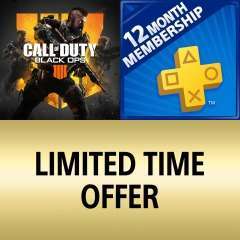 Presume starts a new ps plus subscription? Excellent deal. Have you found your shoe yet? So the code works on ps plus subs (but not pre orders)? It worked on a 1-month and it was working on a 12-month I had in the basket... not sure about this deal but I can't see why not. Pre-orders don't go into your basket - they have an instant-checkout. HotIndonesianDeals. Waste of time. Cold. My UK Sub runs out in June, if I sign up for the Indo Sub will I lose all my Plus games that were acquired on that Account? My UK Sub runs out in June, if I sign up for the Indo Sub will I lose all …My UK Sub runs out in June, if I sign up for the Indo Sub will I lose all my Plus games that were acquired on that Account?